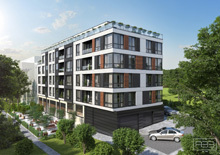 "Buy in Bulgaria" presents to your attention a residential apartment complex located in Byala, 55 km from Varna. The complex is located 550 meters from the sea, on a hill that provides a beautiful view of the sea from each apartment. The total area of ​​the land on which the complex is built is 1,370 square meters. The complex consists of two buildings. Each building has five apartments: three-bedroom apartments from 118 to 135 m2 with terraces and a penthouse with a circular terrace (terrace area of ​​83 m²) and a ground floor apartment with an area of ​​56 m ² and Access to the swimming pool. The complex is equipped with swimming pool, two saunas (one in each building), two gyms with an area of ​​25 m² (one in each building), BBQ area and parking. The apartments on the first floor have a garage. All apartments are equipped with cable TV, telephone and intercom system. The building has a system of steam heating with solid fuel heating system and water - by using solar and electric water heater.